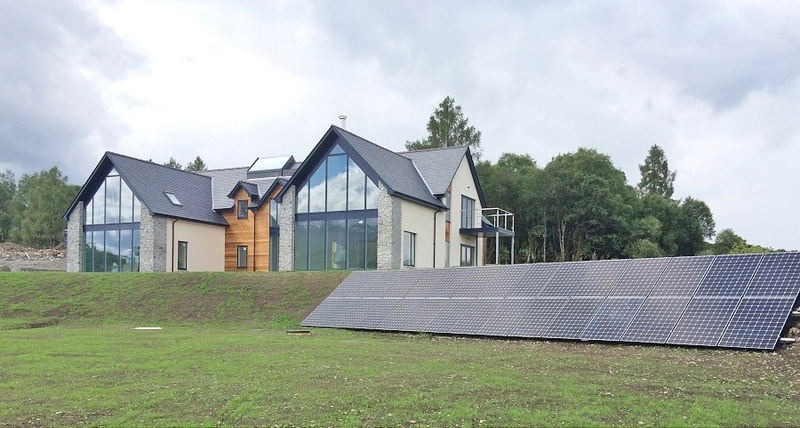 Situated in the beautiful highland surroundings of Spean Bridge, this eco-house is served by a 9.81kWp Sunpower PV system, two SolarEdge inverters and a Tesla Powerwall integrated so that the house will be able to benefit from solar PV power at night. The house is heated by a ground-source NIBE heat pump (not installed by Ceiba). Dr Giles, the customer, wanted his new home to be as self-sufficient as possible. With a SAP energy calculation of 7,022kWh for heating, hot water, ventilation and lighting the aim was to be net carbon-neutral – i.e. the solar PV system should generate more electricity per annum than the house consumes. As a new build project, the initial design had been for an in-roof system over multiple roofs. However, after consultations with Dr Giles we agreed that due to the sliding roof and other factors that a ground-mount option would be better suited to this project – Ground-mount systems have the advantage of being able to be oriented to south and aren’t as restricted as a roof for space so we could increase the size of the system. To enable use of some excess solar power at night we specified the 6.4kWh Powerwall from Tesla. The results so far have been very good. Visually the solar PV system looks great, seamlessly built into the hill at the front of the house. Data for 2017 shows that self-consumption is sitting at 64% having generated 2,485kWh from 1st Jan 2017 to 6th May 2017. That means that 1,580kWh have been used in the house, while 895kWh have been exported. 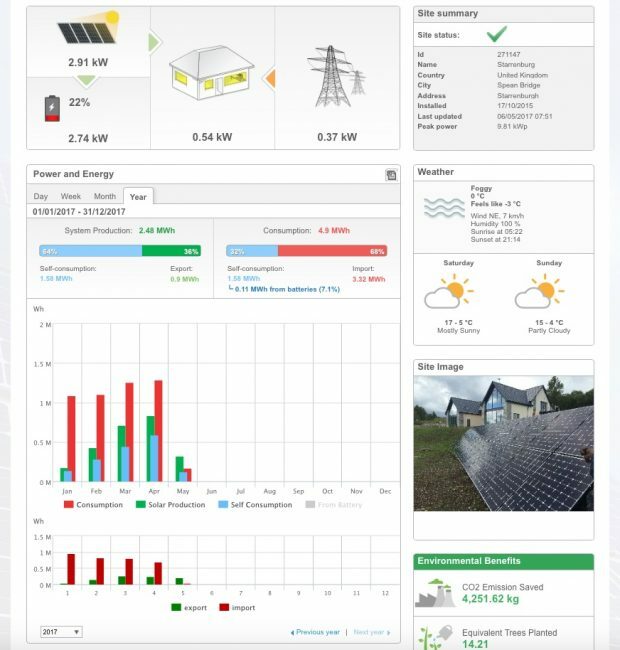 The house electricity consumption has been 4,900kWh, with self-consumption of solar power standing at 32% (1,580kWh) and we’ll expect that percentage to increase in the coming summer months. Since installation in June 2016, the solar PV system has saved 4.2 tonnes of CO2 and having used Sunpower panels with their Cradle2Cradle certification, the solar PV system itself is already carbon negative. Overall, the solar PV system is making a significant contribution to the energy requirements of the house. With this data we’re building up a valuable picture and it’s clear that there is scope for more battery storage in the future to further enhance self-consumption and savings.